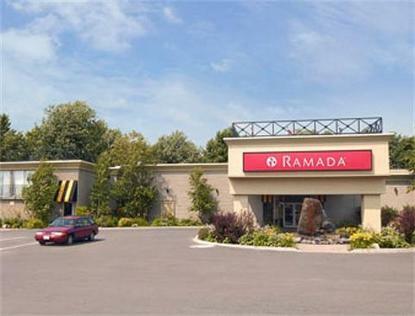 The Ramada Inn and Conference Centre of Cornwall is located 2 miles south of Hwy 401 at Exit 789, just 1 mile north of the scenic St. Lawrence Seaway and the US Border. Conveniently close to the downtown core of Ontario's most easterly city, both Ottawa, ON and Montreal, PQ are only one hour from the Ramada Inn and Conference Centre. The Ramada Hotel is located right at the base of the Seaway International Bridge making it easily accessible to and from New York State. Across the street from the Ramada Inn and Conference Centre Cornwall is the city's largest shopping mall, Brookdale Centre. Ramada Inn and Conference Centre Cornwall has 116 large and recently decorated guest rooms and two elegant luxury suites. The hotel features an indoor swimming pool, sauna, hot tub, exercise room, and children's playground. Ample complimentary parking and our on-site Brook Valley Grille and Lounge complete the value at the Ramada Inn and Conference Centre of Cornwall. Property is 100 Percent Non Smoking. The Ramada Hotel is Pet Free. Sorry No Pets Allowed.